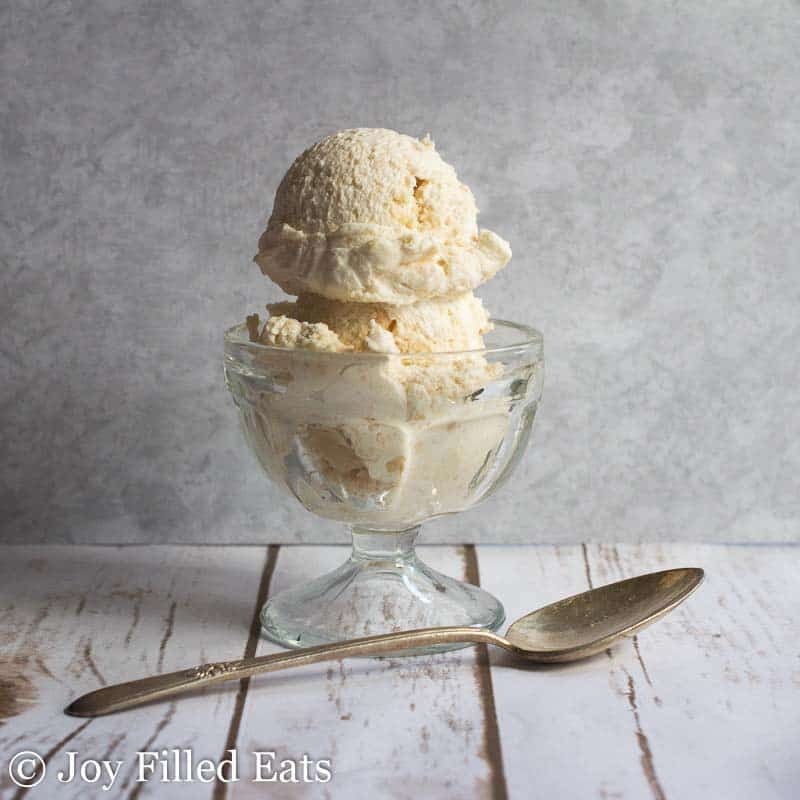 This Salted Caramel No Churn Ice Cream is incredibly rich and decadent. It is fluffier than an ice cream but not quite fluffy enough to be a mousse. The chunks of salted caramel throughout are little bites of pleasure. It has only 6 ingredients and you don’t need an ice cream machine! 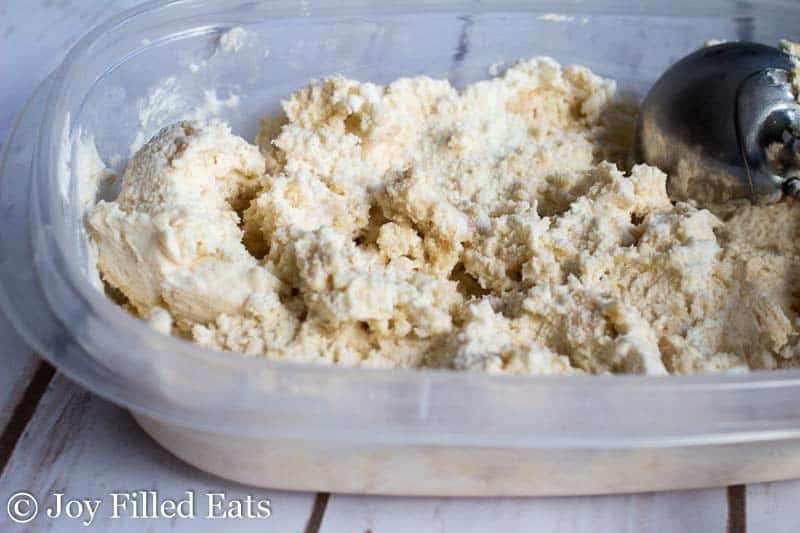 If you’ve always wanted to try to make ice cream but haven’t wanted to shell out $40 for an ice cream maker this is a great recipe to start with. I do love my ice cream machine but I enjoy a no churn ice cream without having to drag it up from the basement as well. 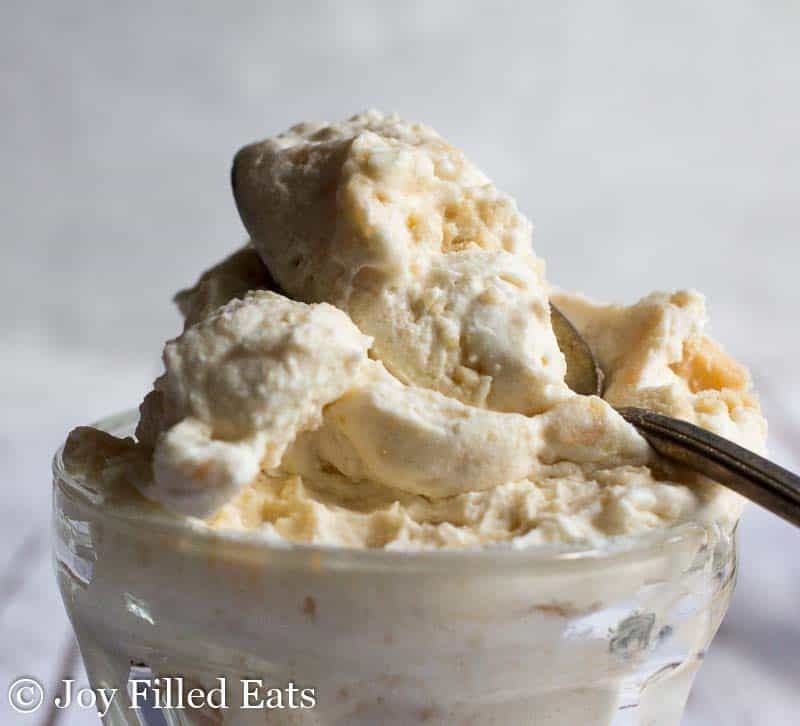 This trick to a no churn ice cream is to whip the cream. 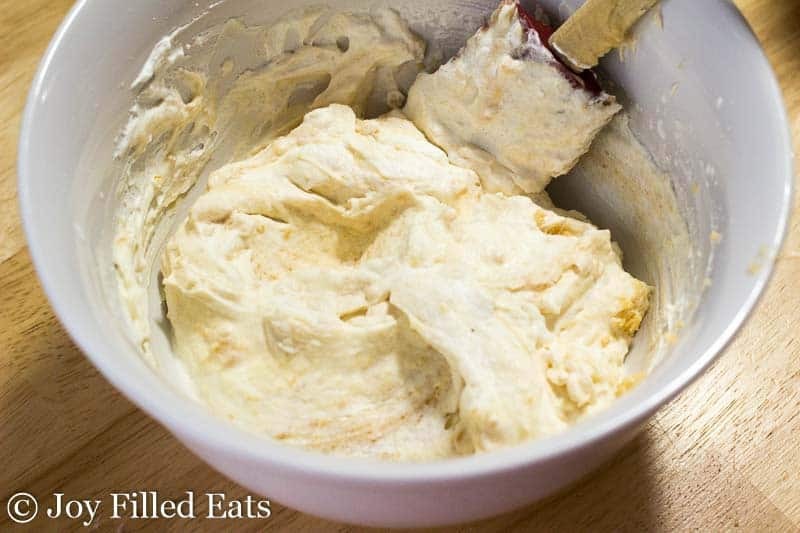 By gently folding in whipped cream it incorporates air the same way an ice cream machine does as it slowly freezes the ice cream base. Salted caramel is one of my favorite flavors for just about everything. Ice cream, cake, cupcakes, yogurt, popcorn, candies, and more. Anything I can get that salted caramel flavor onto I do. The contrast between the sweetness of the caramel and saltiness of the sea salt is perfection. One of the six ingredients I use is my sweetener blend of Now brand xylitol, erythritol, and stevia. I use this in all my sweet recipes. It is extremely versatile. It is twice as sweet as sugar so you use less than some other sweeteners and it doesn’t have an aftertaste. It is cheaper than many other sweeteners as well. You can check out my recipe for my sweetener here. Try not to just eat the caramel sauce with a spoon. It will be hard but you can do it. Step 1: Make the caramel sauce and let it cool. Step 2: Beat the cream. Fold together. 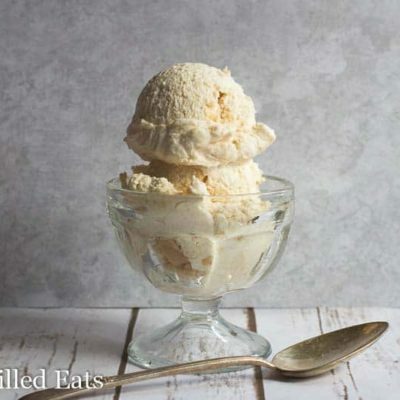 This Salted Caramel No Churn Ice Cream is incredibly rich and decadent. It is fluffier than an ice cream but not quite fluffy enough to be a mousse. The chunks of salted caramel throughout are little bites of pleasure. 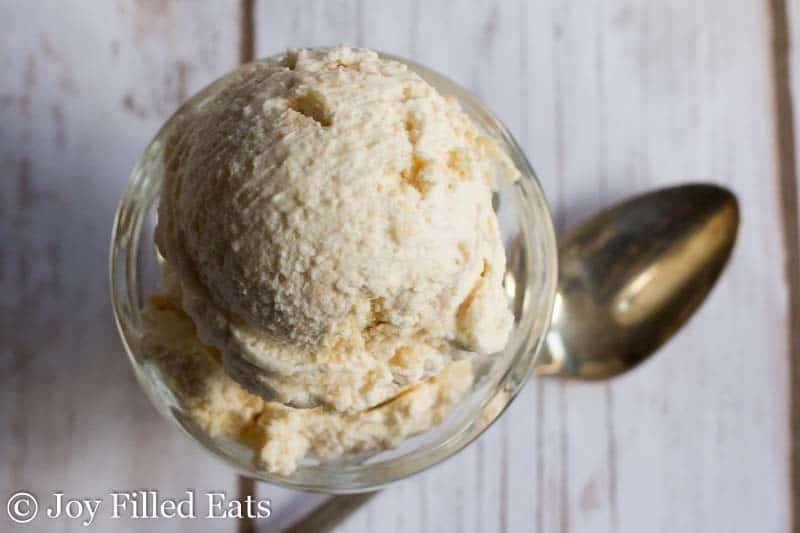 It has only 6 ingredients and you don't need an ice cream machine! Put the butter, sweetener, and half and half in a medium saucepan over medium-low heat. Cook for about 15 minutes, stirring occasionally until thickened and golden. Remove from the heat and whisk in the yogurt and salt. Cool to room temperature. Set aside 1/3 cup of the caramel sauce you just made. 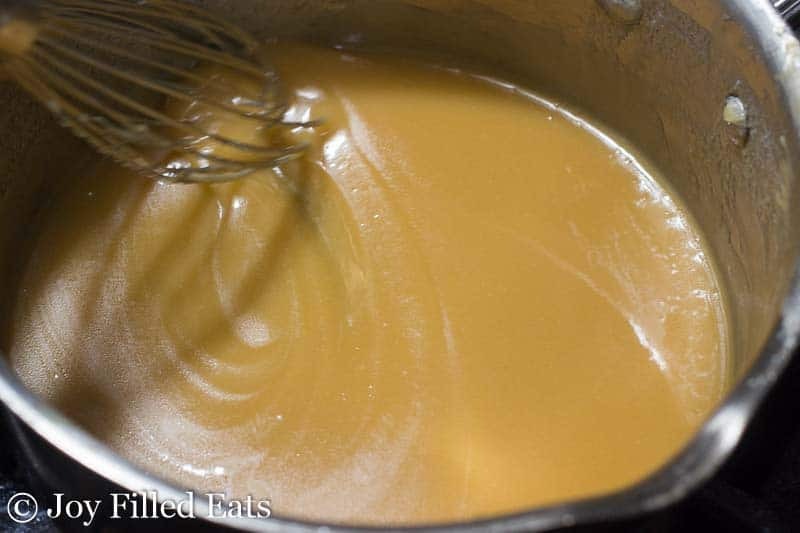 Add 1 oz of the heavy cream to the remaining caramel sauce and mix with an electric mixer until smooth. In a large bowl beat the remaining 7 oz of heavy cream until stiff peaks form. 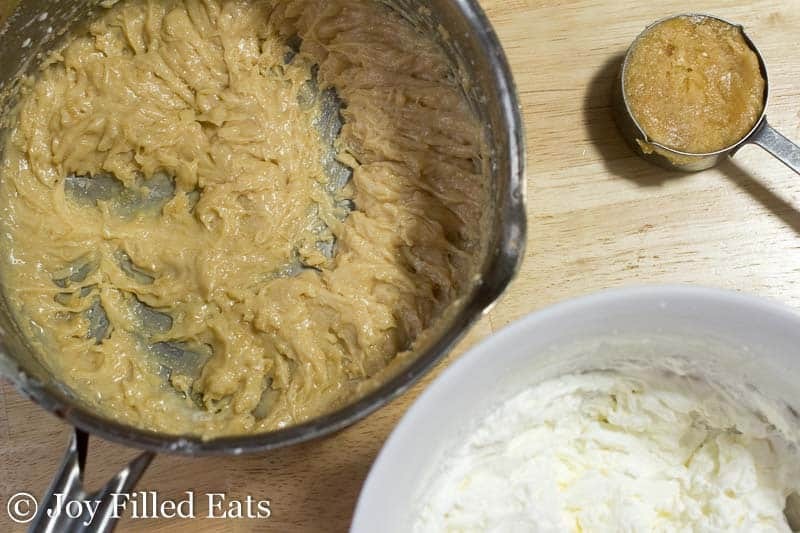 Gently fold the caramel and cream mixture into the whipped cream. 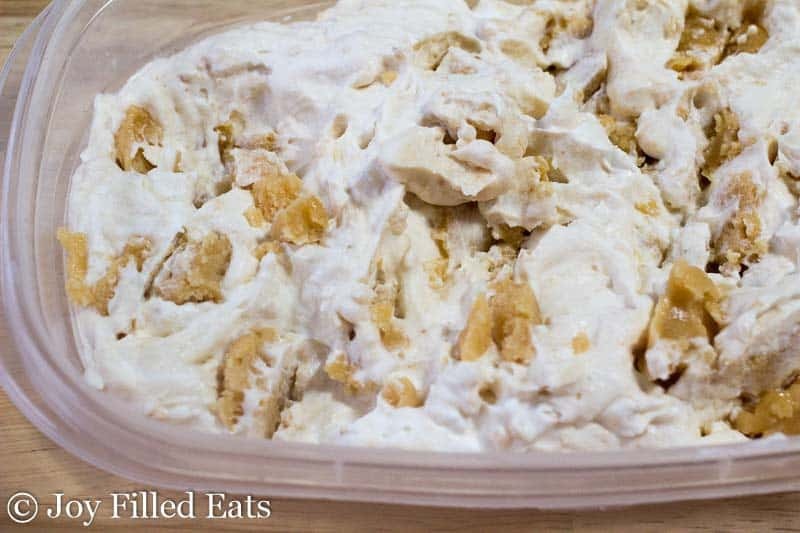 Put into the container you will use to freeze it in. Pour or scatter bits of the remaining caramel over the top (mine was too thick to pour by this point). Cover and freeze for at least 6-8 hours. Yes, it will be very rich. If using an ice cream machine I'd probably add some almond milk to balance the cream. How much almond milk? I want a salted caramel ice cream to do in my machine. Do you buy the whipped cream or make it? If you make your own...what’s the recipe for that? Thanks! You make your own. The instructions are in the recipe card. If you'd like to make extra whipped cream to servein top just beat the cream and then add a little sweetener to taste. How would the sweetener ratio work out if I use THM super sweet? I'm not sure super sweet would work for the caramel. If you want to try anyway you need half as much. This might need the bulk of the sugar alcohols in gentle sweet. 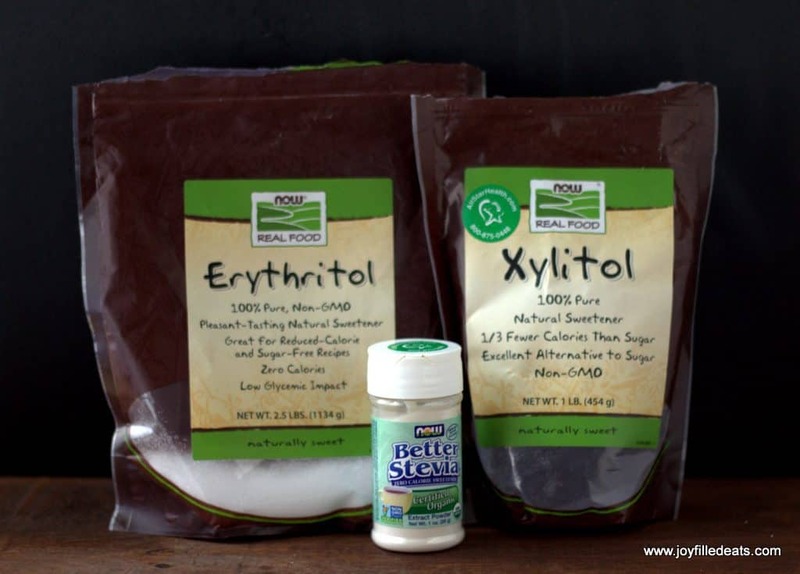 If you do not want to use xylitol you can use super sweet plus extra erythritol. Hello! Love your site! I don't use half and half. Is it OK to replace it with heavy whipping cream? Thanks! For those who prefer to use regular sugar, can you advise on the amount which would be the equivalent to your sweetener? About twice as much. I'm not sure how or if the recipe would work with cane sugar though. Can I substitute Swerve for the sweetener? It looks delicious...cant wait to try it? Thank you! I think so but you will need more. Swerve measures 1:1 for sugar, my sweetener is 2:1. I used a cup of Swerve and it was a little sweet for my taste. I would probably only use a 1/2 cup next time. This was a yummy recipe. Regular yogurt or Greek? Thanks! I used regular plain yogurt. Yum! I can't wait to try making this! What is the salt for? I just edited the instructions to include it. It is added to the caramel for a salted caramel flavor.